Lake Macquarie Skips has been a constant and reliable partner when it comes to waste disposal and getting rid of rubbish from your home or construction site in Newcastle and the Hunter Valley. The use of a skip bin or mini skip bin is a smart way to conveniently and cost effectively disposal of your wastes. With the large variety of waste materials you can put inside our Lake Macquarie skip bins, it is important to be aware of what can and what cannot go inside a skip bin hire. One of the reasons why we use Lake Macquarie skip bins is to ensure proper waste disposal. A Lake Macquarie skip bin is the ultimate tool to get your rubbish to its rightful place – most often a landfill. However, there are some waste products that cannot be brought to landfills along with your household wastes because they pose a hazard. On the other hand, some items can be recycled and used again. It is easy to segregate common waste items, but what about liquid wastes? Can you put your liquid waste in a skip bin? The answer is no, and here are the reasons why. Some specific items are prohibited by law to be disposed in a skip bin. There may be slight differences when it comes to laws regarding waste disposal in each council, but there are some items that are generally prohibited from being placed in a skip bin. These include human and animal waste, and also liquid wastes such as paint, oil, chemicals, and thinners. 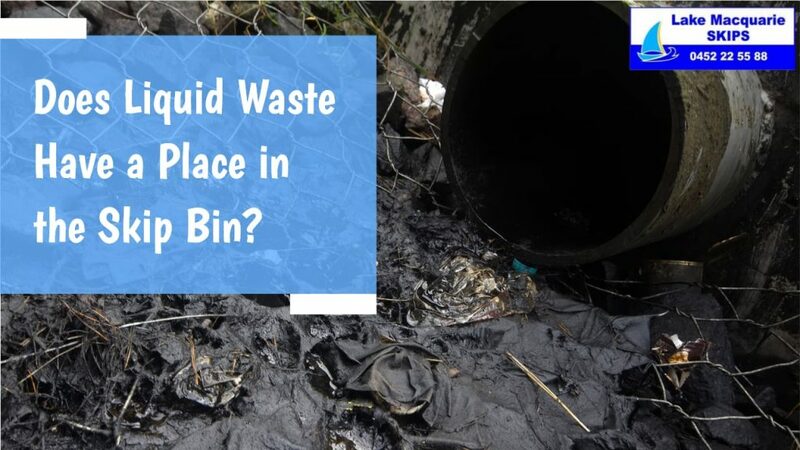 Liquid wastes are not placed inside a skip bin because they can potentially be toxic and harmful not only to the people handling the waste but also the environment. There are better ways to dispose your liquid waste. The rubbish you put inside your mini skip bin hire goes to the landfill. Or, items that may be recycled such as papers, metals, and plastic bottles are taken to recycling plants. Liquid waste does not belong in any of these places. It may even affect the materials which may still be able to be recycled, or make the landfill waste toxic. Hazardous liquid waste includes flammable, explosive, toxic, and corrosive materials such as alcohol, petrol, diesel; oxidising agents and organic peroxides; pharmaceuticals, poisons, clinical, cytotoxic and sharp wastes; environmentally hazardous chemicals; and any type of liquid food wastes such as alcohol and dairy products, contained or not. One way to dispose these is to participate in Lake Macquarie City Council’s Chemical CleanOut events which are held twice every year. At these, you can drop off your liquid waste free of charge. Do not put restricted items in your skip bin hire to avoid charges. A Lake Macquarie skip bin found with improper segregation, which includes skip bins with liquid wastes, may be returned to you, and this will cause additional expenses. Lake Macquarie Skips will not be able to process and unload your waste materials normally if they contain liquid wastes. Remember that skip bins are for general waste, and there is still a proper disposal for each type of waste. If you are still unsure about what type of skip bin you should hire, or the waste products you are permitted to put in it, contact Lake Macquarie Skips now. We’re happy to assist and guide you throughout the process of waste removal in your place, to make the renovation, clean up, or any other project easier, environmentally safe, cost friendly and hassle free.